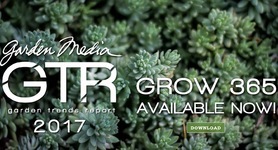 Each year we highlight topics of growing importance in the gardening realm. For 2018, our trends emphasize the concept of providing pleasure to people in their gardens—whether it’s growing new foods, providing a refuge for wildlife, or creating a relaxing place to share a meal with loved ones. Enjoy! 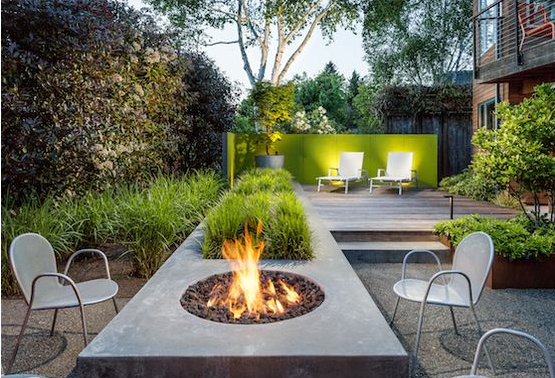 These days, space is at a premium—but, designers are determined to make even the smallest of gardens useful and attractive. While small gardens are by no means new, we've noticed great progress in the way they are designed. In this case, less really can be more. 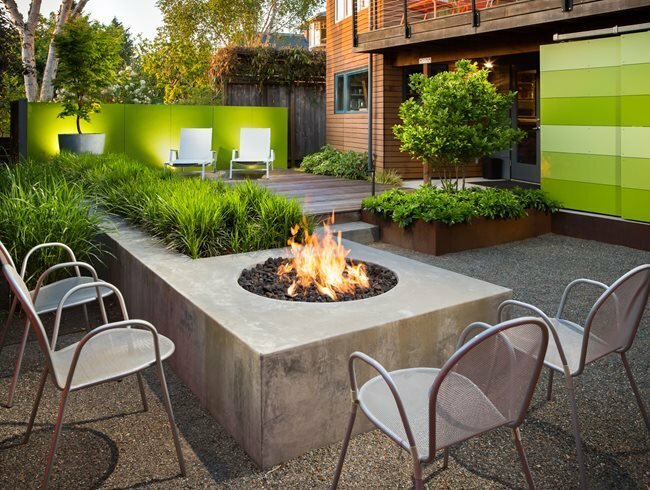 This fire feature saves space by serving a variety of purposes. Design by: Scot Eckley. Photo by: Alex Crook. Container Combinations: One of the best ways to appreciate and explore combinations is in a container. A plant may be exquisite on its own, but its assets can be magnified when placed in a context—with plants that complement its color, structure, or textures. 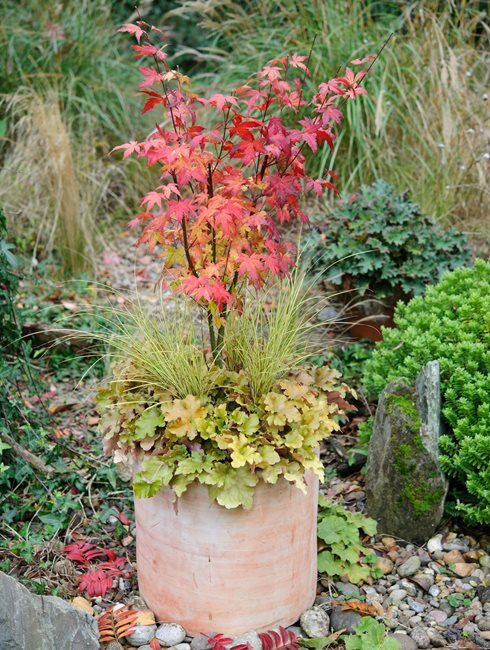 Immensely popular in urban gardens, Japanese maples grow relatively slowly and can flourish in containers for years. They dislike being exposed to hot sun and wind. Here they are grouped with greater brown sedge and alumroot. Design by: Bob Purnell. Photo by: Jason Ingram. For years, outdoor dining spaces have been conveniently located just off the house, near the kitchen. However, we’ve noticed dining spaces being pushed out into the garden. Yes, you’ll have to carry your plate a bit further, but it’s well worth it. 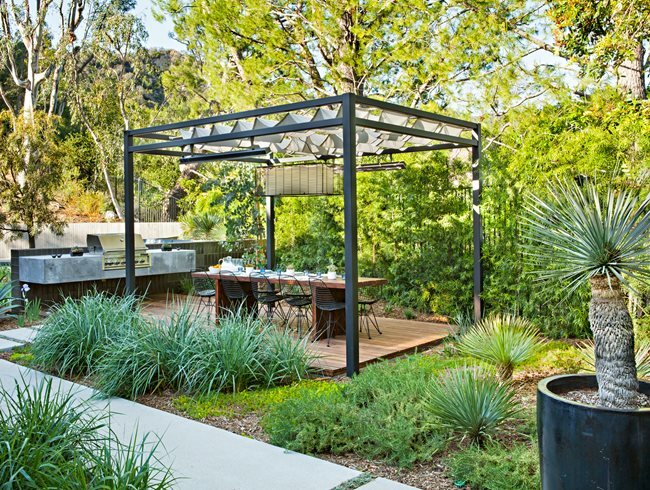 This backyard retreat for outdoor dining draws you out into the garden for a more immersive experience. Design by: Di Zock Design in Los Angeles, CA. Photo by: Bret Gum. “Many people automatically design outdoor dining spaces right off the back of the house. But making an all-inclusive destination within the landscape immerses people in the ambience. It makes for a more luxurious experience and guests get to see more of your garden,” says Di Zock of Di Zock Design in Los Angeles, CA. With so many mass-produced products around us, we often forget that people still make things by hand. The following examples prove that in the garden handcrafted is always best. We hope they encourage you to seek out an artisan next time you add a structure or other important element to your property. Photo by: Alison Shaw from Sticks and Stones: The Designs of Lew French, reprinted by permission of Gibbs Smith. Lew French, based on Martha’s Vineyard, builds pieces that look as if they have stood for eons. His Three Walls project was a collaboration with landscape designer Wes Wirth. French’s original design for the opening over the pool ended with the straight lintel. 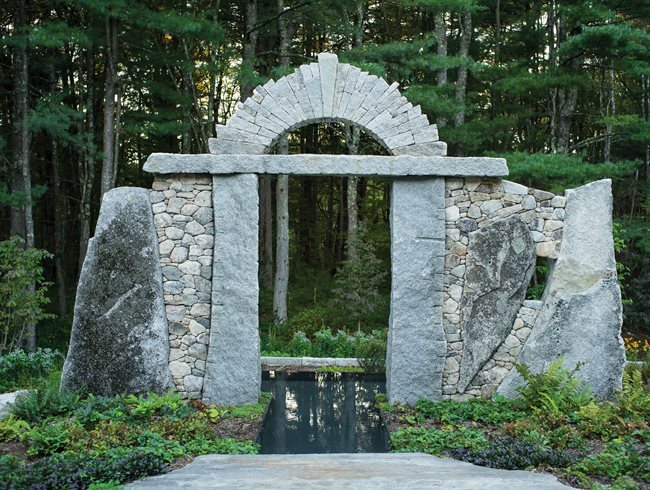 Unsatisfied with the way it looked, he added the arch of granite wedges. Design by: Oehme, van Sweden + Associates. Photo by: Roger Foley. This arbor adds intimacy to the garden and also screens the neighbor’s yard. The vertical oak pieces are 12 inches thick, so it’s sturdy and gives the feeling of permanence. “Being plant fanatics, we often use pergolas and arbors as armatures for vines and climbing plants. 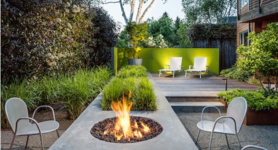 They’re a great way to introduce color, fragrance, and texture—or even an edible landscape on a vertical plane,” says Eric Groft, Landscape Architect with Oehme, van Sweden + Associates in Washington, D.C. Most gardeners are aware that bees and butterflies are in decline, but did you know that habitat loss is also impacting birds, frogs and even turtles? 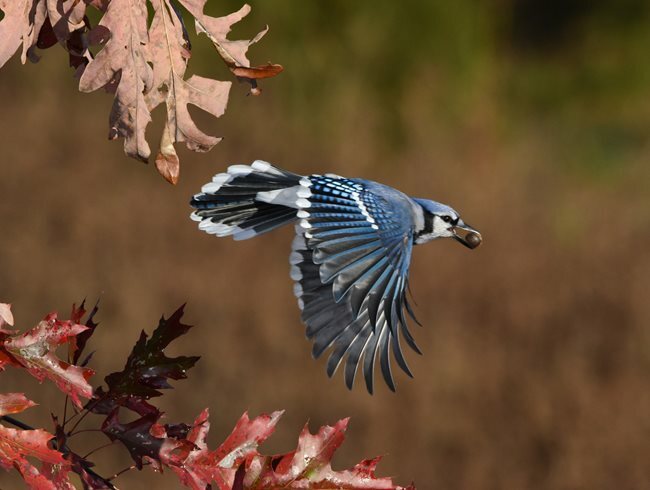 A bluejay with an acorn. Photo by: Doug Tallamy. “Most of this dwindling habitat became our expanding cities and sprawling suburbs—spaces that have been designed for convenience and aesthetics, with little thought to the needs of local wildlife. Yet there is no reason we can’t create convenient, beautiful landscapes that also meet the needs of many, if not most, of our animal neighbors,” writes Doug Tallamy, professor and chair of the department of Entomology and Wildlife Ecology at the University of Delaware. We love the willingness of gardeners to try new things. This year, we predict continued experimentation with new plants and how they are showcased. 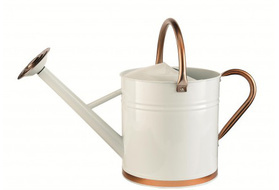 Following are three ways you can add some botanical variety to your garden or home. Grow Unusual Edibles: There is a big, wide world of diversity available to gardeners through seed companies, seed swaps, and community gardens, so make your veggie garden reflect this trend and try a few new-to-you crops. Cucamelons are about the size of grapes with a flavor similar to cucumbers with a hint of sourness. Photo by: Niki Jabbour. “Food gardening continues to be incredibly popular with gardeners of all ages, and for me, a big part of the fun in food gardening is trying new edibles; from quirky cucamelons and burr gherkins to super-sweet ground cherries. From chickpeas and edamame to heat-tolerant, exotic greens like magenta spreen, sweet potato leaves, and amaranth,” says author Niki Jabbour, who has a new book called Niki Jabbour’s Veggie Garden Remix. Get Creative with Houseplants: Don’t limit yourself to the typical pothos or ficus in a corner. Instead, think of houseplants as integral design elements in your private sanctuaries, fulfilling the same roles they do in the garden outside: leading the eye, creating focal points, providing repetition and contrast, framing views, and lending texture, color, and form. 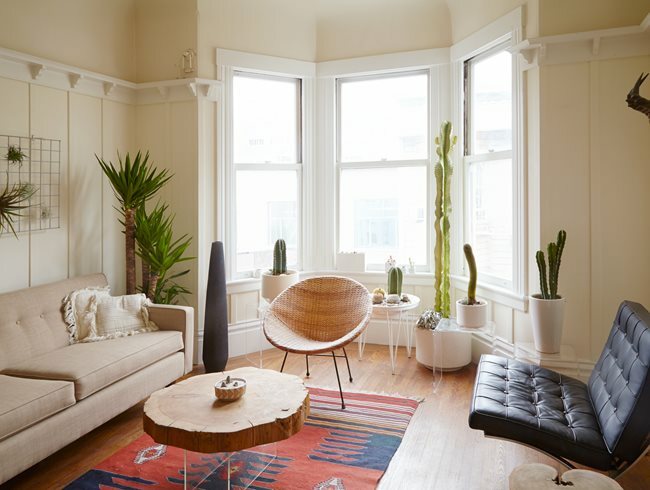 Designer Zenaida Sengo’s living room in San Francisco sparks fond memories of desert hikes with a collection of vertical succulents and a Navajo-inspired rug. A Yucca elephantipes (spineless yucca) brings height without width to a narrow corner space. Continuing the low-water theme, on the wall a lattice sporting tufts of Tillandsia (air plant) is a botanical twist on over-the-sofa art. Photo by: Caitlin Atkinson. 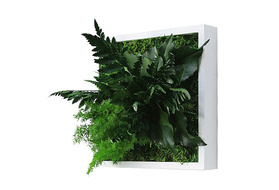 Barbara Pleasant, author of The Complete Houseplant Survival Manual, dubs this “interiorscaping.” She has found the precepts of feng shui particularly helpful in plant placement. For example, she says placing plants near the front door connects the interior to the exterior. 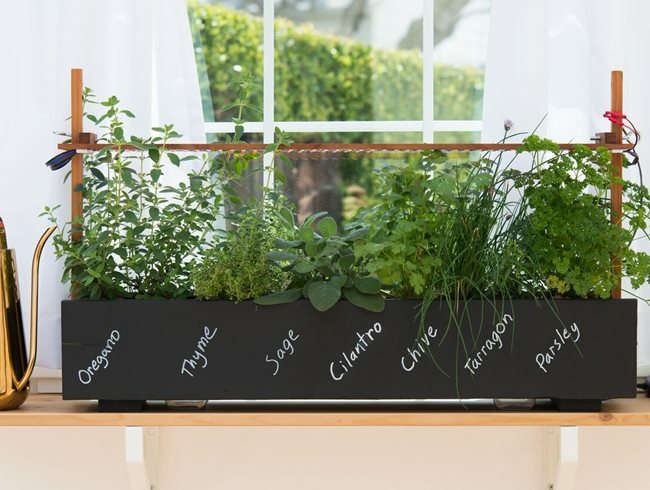 Herbs grow happily in this indoor window box. Photo by: Ryan Benoit. Chantal Aida Gordon and Ryan Benoit, authors of the new book How to Window Box (Clarkson Potter), suggest setting up a window box indoors to enjoy a few square feet of garden all year round. “Even though window boxes have a reputation for being classic and traditional, they are also an excellent way to experiment, especially if you're working in a small space. You can dedicate a window box to your favorite spring blooms like tulips and daffodils, to culinary herbs, or to carnivorous plants like pitchers and Venus flytraps. Or take a big enough box and make it lush with ferns or fill it with tropicals like pothos vines and monstera,” they suggest. 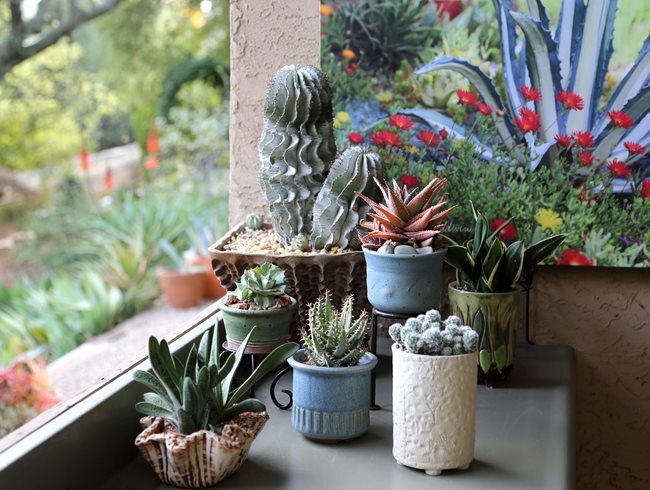 Cultivate a Succulent Collection: “Not too long ago the gardening public thought of succulents as cactus or jade and dismissed the entire category as too spiny or common. Today, it’s possible for anyone, anywhere to cultivate any kind of succulent. The plants like the same conditions you do: warmth, fresh air, sunlight, and dryness. What once was exotic is now available at your local nursery or via mail order. Even potentially immense succulents stay small and manageable in pots, which are portable and can be moved and sheltered where the weather turns too hot, too cold, or too wet for their liking,” explains Debra Lee Baldwin in the completely revised second edition of her book Designing with Succulents. This outdoor countertop is a great location for displaying a collection of potted succulents. Photo by: Debra Lee Baldwin. Get ideas for creating your own succulent container gardens. The most common method for enclosing a garden is with a fence. Of course fences have practical purposes, like containing pets or preventing trespassing, but they aren’t always the most attractive solution. This is why we love the new style of enclosing gardens with lush plantings that offer privacy, yet are attractive and welcoming. Design by: Mosaic Gardens. Photo by: Claire Takacs. 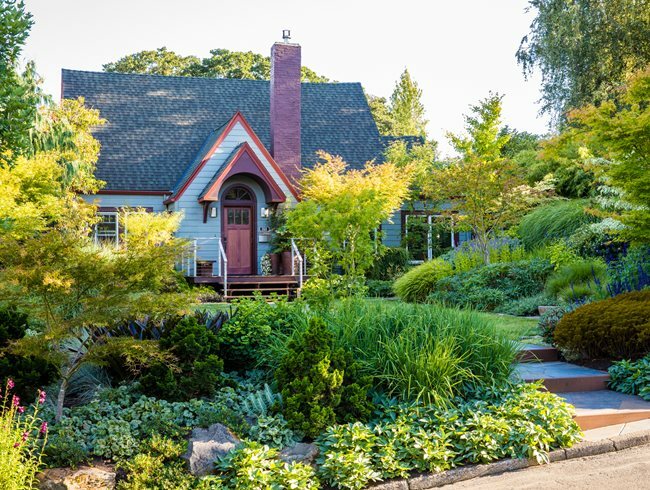 Learn eight landscape design rules for residential gardens. Another trend we’ve observed is that gardeners are putting more thought into their winter landscapes. Even the most devoted snow lover has to confront a harsh truth sooner or later: An empty landscape is a dreary landscape. However, during the dormant season, dazzling color and sophisticated textures can enliven the garden. 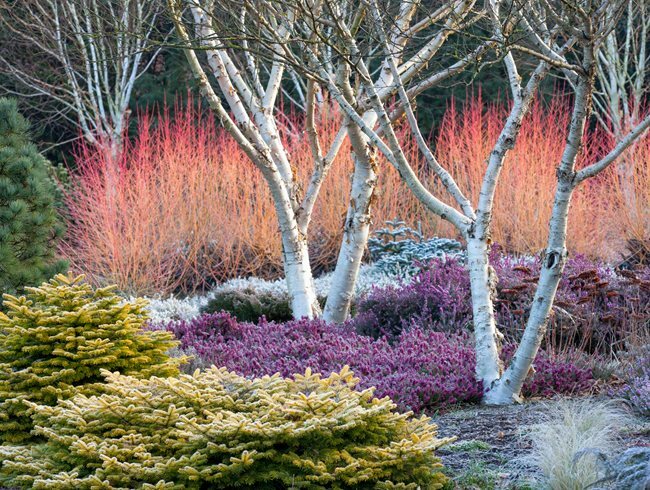 Low-growing plants provide a lush carpet, allowing the silverwhite bark of Betula apoiensus ‘Mount Apoi’ and the fiery stems of Cornus sanguinea ‘Midwinter Fire’ in the background to shine. Front left: golden leaved Abies nordmanniana‘Golden Spreader’; between the birch are winter-flowering heathers Erica carnea‘Vivellii’ and ‘Springwood White’.Photo by: Richard Bloom. 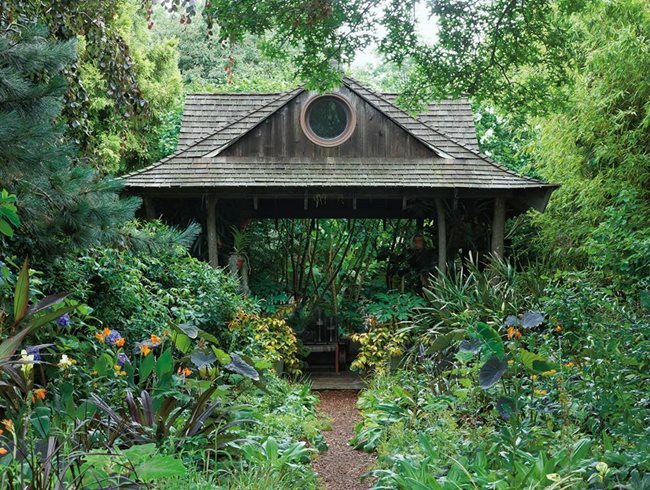 “Consider views from the windows where you spend a fair amount of time,” says horticulturist and garden designer Adrian Bloom, an expert in winter color at his family’s Bressingham Gardens and Foggy Bottom Garden in Norfolk, England. He also advises selecting plants and combinations that marry toughness, color, and texture. Furthermore, contrast—dark branches, bright green conifers, and fiery Cornus or red osier, for example—is an obvious and excellent strategy. Ultimately, design for the winter garden depends on simplicity, elegance, and smart design. 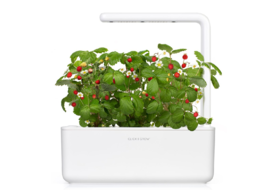 “You don’t need a vast range of plants to provide interest and change,” Bloom says. There’s no better way to get inspiration than visiting world-renowned gardens in person. 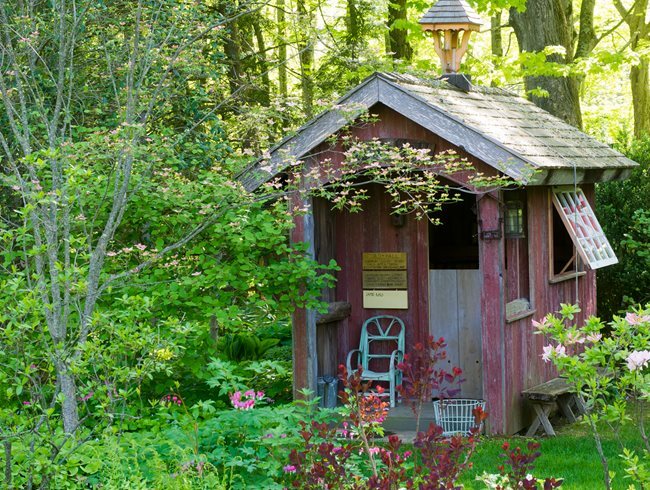 Each year, incredible trips and local tours are planned specifically for gardening enthusiasts—and 2018 is sure to be a great year for exploring gardens near and far. 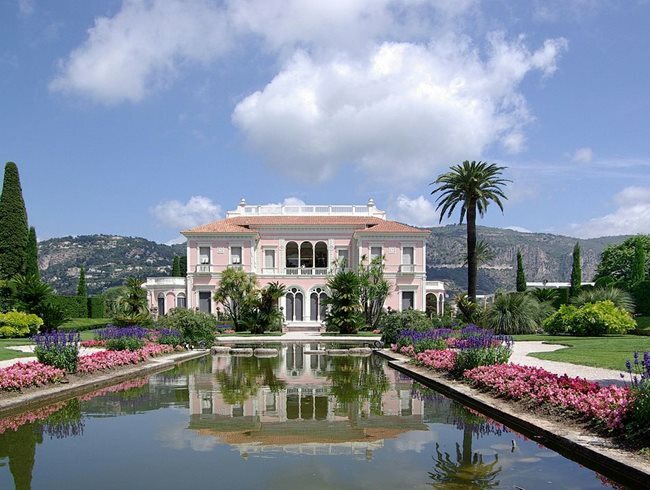 Villa & Jardins Ephrussi de Rothschild, located between the French cities Nice and Monaco, has magnificent gardens worth exploring. Photo by: Earthbound Expeditions. “Imagine touring both private and grand public gardens such as villas and palaces with like-minded travelers who share your passion for garden design and nature,” says Matthew Brumley of Earthbound Expeditions, a company that crafts specialized travel experiences. He urges you to consider essential garden destinations such as England, Ireland, France, Italy, South Africa & New Zealand. Or you can expand your interests to include nature trips to biodiversity hotspots such as Cape Town, South Africa or Costa Rica. 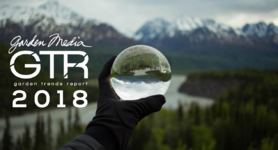 “Not only will you have the experience of a lifetime, led by expert hosts and local on-the-ground experts, but you can feel good about your adventure because you will be supporting local businesses,” he adds. Find the right trip for you on our garden tours and travel page. The garden of Landcraft Environments’ Dennis Schrader and Bill Smith was part of the Garden Conservancy’s 2017 Suffolk County Open Day. Photo by: Marion Brenner, from Outstanding American Gardens. If traveling abroad isn’t an option, you can experience the transformative power of gardens much closer to home through the Garden Conservancy’s Open Days program. 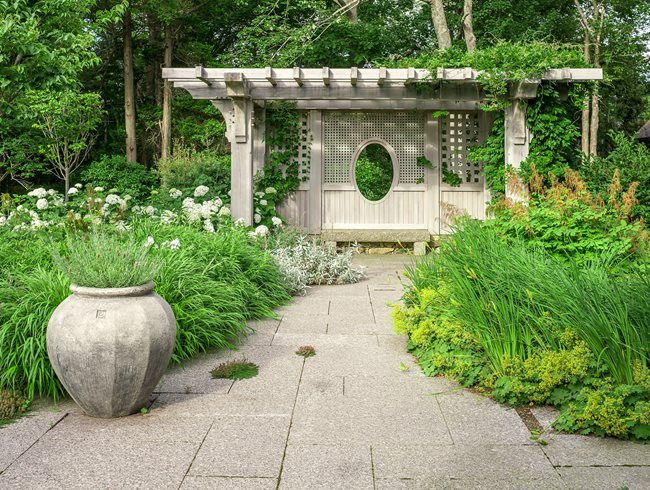 Last year, they opened the gates to over 300 private gardens in 18 states, allowing thousands of people to discover beautiful spaces not usually open to the public. The Open Days events begin in early spring and continue through late fall, check the schedule online and sign up for updates in your area. When you return home to your own garden, you will see it with new eyes. 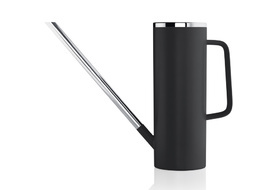 You’ll have discovered unique plants to grow and surely have a garden project or two in mind.